These new signals will include Europe’s version of the multiplex binary offset carrier (MBOC) design that the European Union and the United States agreed will be broadcast in common on Galileo’s Open Service and the future GPS civil signal at the L1 frequency. The U.S. version of the MBOC will not be available until the first GPS III satellite is launched, currently projected for 2014. A European industrial team led by Germany’s Astrium GmbH built GIOVE-B, with Thales Alenia Space performing integration and testing in Rome and EADS Astrium UK providing the navigation payload. The satellite is now under the control of Telespazio’s spacecraft operations center in Fucino, Italy, which has begun checking out the in-orbit operation of the satellite. Like its predecessor GIOVE-A, the second Galileo satellite carries two small rubidium atomic clocks, each with a stability of 10 nanoseconds per day. But it also features an even more accurate payload: a passive hydrogen maser (PHM), with stability better than 1 nanosecond per day, the first of its kind ever to be launched into space. On operational Galileo satellites that will begin launching within a few years, two PHMs will serve as primary onboard clocks, with the two rubidium clocks serving as back-up. GIOVE-B also incorporates a radiation-monitoring payload to characterize the space environment at the altitude of the Galileo constellation, as well as a laser retroreflector to enable high-accuracy orbit determination using laser ranging. Launch of the new spacecraft was delayed for more than a year following a catastrophic electrical short that occurred during testing in the Thales Alenia Space laboratory in the summer of 2006. 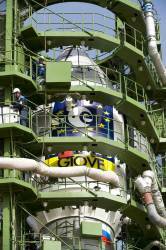 A further delay from a December 2007 launch date stemmed from the absence of a suitable Soyuz rocket. These delays, however, gave ESA the opportunity to add the MBOC signal to the navigation payload at the cost of a few million additional euros, according to Paul Verhoef, head of the Galileo Unit in the European Commission’s Directorate for Energy and Transportation.